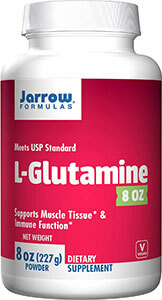 L-Glutamine® the most abundant amino acid in the human body - is involved in many metabolic processes, including the synthesis and protection of muscle tissue, the production of glycogen, as well as immune support during periods of immune and muscular stress. L-Glutamine is also a major source of fuel for enterocytes (intestinal cells) and hence supports the integrity of the intestinal lining. Recommended to aid in healing of leaky gut and ulcers.